Moscow hosts its fourth International Biennale for Young Art this summer, highlighting works on the theme of “A Time for Dreams” by 83 artists from 32 countries selected by artistic director David Elliott. He tells RBTH about the idea for the exhibition. RBTH: What is the difference between co-called “young” art and contemporary art besides the age of the artists? David Elliott: It’s a random category where 35 in this case means 35 years old. It happens to be one of the conditions on which this biennale has traditionally been organised since its beginning. It does provide a chance to look at people who are still innocent in the world in which they find themselves. RBTH: Can you tell us a bit about concept of the exhibition? Especially its title: “A Time for Dreams”. Are you paraphrasing Martin Luther King’s “I have a dream” speech, which was a call for an end to racism? D.E. : Well, it wasn't just racism that he was talking about, in general he talked about life in a world where things are treated more importantly than people. The title was chosen as an acknowledgement of the urgent need for the dreams of younger generations to break the wall between the past and the future. In the exhibition, you can find pieces that were chosen to represent the work of artists from across the world, you definitely can dive into and literally feel the multicultural environment. For example, for the first time in the history of the biennale, a large number of applications this year came from Australian and Asian artists. I think that contemporary Art is a worldwide category and there are no value judgments in something being contemporary. The value judgments could be only whether people think it is good or not. RBTH: What are young artists dreaming about? D.E. : Lots of things! Despite the number of conflicts in the world, people believe that peace and morality will triumph. In the period of Nazi terror for example, people thought that what was ahead of them was absolutely the beginning of the end of the world. That’s less the case now than it was but still the situation is far from hopeful. The exhibition allows us to see how artists are bringing together the microcosm of themselves, (and) an understanding of the universe which may be informed by science and technologies. This is what their dreams are made of. The dream of good art, I think, has to be connected with a strong belief in life, ethics and truth. RBTH: And what are you dreaming about? D.E. : I dream about a situation in which people are not bound by custom and can actually think for themselves.To be honest, we need to sack most owners of newspapers and media stations, reform education and change our politicians. I’m dreaming about intelligent and humane people running these things. RBTH: Artists from which countries impressed you the most? D.E. : Everyone in the show impressed me, otherwise they would not be in the show. But there was one slightly wild project. The guy teaching a parrot to sing revolutionary songs, which would be an installation in a show called “An Active God”. The idea is that the parrot has a brain, not a big one but it learns all these things. RBTH: What can you say about the Russian art scene? Now it looks very provocative and sensitive, acting like a teenager. Will it change in the future somehow? D.E. : I believe it’s getting a bit more mature. Russians like any other people want to be part of something. They want to feel part of Russia but also to be part of a wider community. For instance, the artist from Nizhny Novgorod, Artem Filatov, he built a Russian empty wooden house. It was the remains of lots of destroyed houses. This installation operates at lots of different levels. It’s a basic level of protest against the gratuitous pulling down of memory and history. But on the other hand it is very poetic, a beautiful image of Russia itself. RBTH: You have said that almost half the artists are women…. D.E. : I was very happy about this fact, because the whole thing in this exhibition is about human rights. Unfortunately historically they were part of oppressed groups, like black people and Jews. So now we see a balance. RBTH: How do you see the importance of art education? D.E. : To have a space, I mean a physical and a head space to become an artist, it doesn't need to be an educational process. You can't teach anyone how to become a good artist but you can teach them certain skills and ways of doing things, and crafts. Concerning a formal education in art, Russia has huge experience in this field. I know that even Chinese students came to Saint-Petersburg to gain an education here. Now some of them are very successful in market terms, sometimes even more than Russians. RBTH: We see how technology is changing our everyday life. 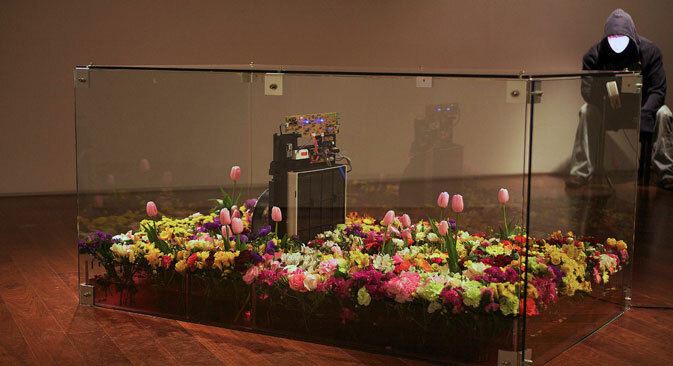 Are there any good or bad sides of such a big presence of new technology in art, especially in young art? D.E. : Media and technology are changing and of course it has an impact on art but it’s hardly the last word. People are still scratching on a rock and painting with charcoal. Social media has changed things in some ways, perhaps they have made people even more superficial than they were before and this has an impact on art. As I said before, I dream about a smart society, so I hope that smart people will use them (technology) if they really need them but will not rely on them. I remember one Egyptian artist came to show a piece about the Egyptian Revolution in 2011 when the government shut off the Internet. Activists started to call Egyptians on mobile phones, and then tweeted out their words. The artwork captured how technologies are changing and helping society in such a dramatic moment. The Moscow International Bienalle for Young Art is located at Vorotnikovsky lane 11/3.